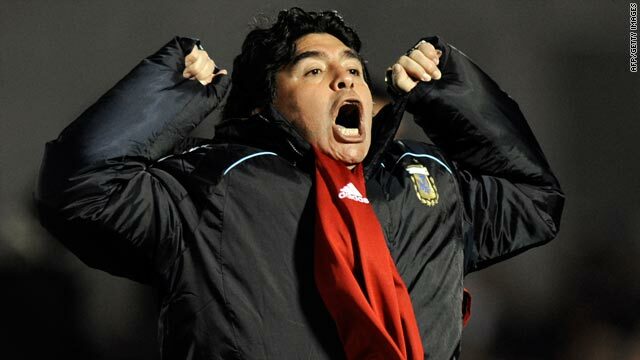 Coach Diego Maradona exploded in relief after Argentina scored a vital winner against Uruguay last month. (CNN) -- Argentina coach Diego Maradona has been handed a two-month ban and been fined almost $25,000 following the football legend's foul-mouthed tirade last month. The 49-year-old let rip in a television interview with a series of scathing comments aimed at his critics after Argentina scraped into the World Cup finals with a 1-0 win away to Uruguay on October 14. The 1986 World Cup winner had been heavily criticized after a string of poor results in qualifying matches, having taken over as national coach from Alfio Basile a year ago. World ruling body FIFA handed out the punishment following a hearing on Sunday at its Zurich headquarters in Switzerland. Maradona apologized at the hearing, the UK Press Association reported, but it was not enough to avoid a suspension which will run until January 15. "The committee reached this decision following a three-hour meeting at the home of FIFA in Zurich," FIFA said in a statement. "The head coach of Argentina was heard by the committee during 40 minutes and apologized to FIFA and the world football family. "The committee took into consideration the apologies and the sincere remorse shown by Maradona in its decision, which was communicated to him at the end of the meeting. "The committee stressed that any breach of this decision or any repetition of a similar incident would mean that stronger sanctions would have to be imposed in the future." Argentina have only one match scheduled during Maradona's two-month ban, a friendly against the Czech Republic on December 16. It means the ban should have little impact on the South Americans' preparations for the 2010 World Cup in South Africa, which start in June. The hearing was held the day after Argentina's 2-1 defeat by Spain in an international friendly in Madrid.